Horses with ‘Red’ in their name have a good record – like previous winners Red Alligator, Red Rum and Red Marauder. That’s a good sign for Captain Redbeard and maybe even Vieux Lion Rouge. Go for a horse with nice colours. The maroon ones with a white star were clearly lucky for last year’s winner Tiger Roll as well as the 2016 winner Rule The World. Funnily enough there are seven horses that wear the same colours (albeit with different coloured caps) in the Grand National field tomorrow. In France, where the majority of betting is conducted through the Paris Mutuel, horses in the same ownership are bracketed together for the purposes of win-bets in a system known as ‘écurie’ – back one owner’s horse and you’ve backed them all. That’d make Tiger Roll and all the other horses owned by Giggingstown House Stud a fairly straight-forward betting proposition but miserable value. Minella Rocco, One For Arthur and Tea For Two also have stars on their silks and so they should go on the shortlist. Diamonds are pretty good too (Red Rum carried a large diamond on his silks), so we should also include Rathvinden, Jury Duty, Ramses De Teillee, Ultragold and Folsom Blue. We tried our best to keep them out with Brexit, but it didn’t work – so anything that’s trained in Ireland has clearly got a chance. We might as well include the Welsh too, as Joe Farrell looks a popular choice for Pembrokeshire trainer Rebecca Curtis. 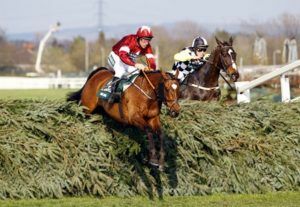 Winning the Grand National is a lifetime ambition for many racehorse owners and once they’ve done it, they have to try and do it again and again. Trevor Hemmings is a good example having won the race with Ballabriggs, Hedgehunter and Many Clouds. He’s got three chances of doing so again with Lake View Lad, Warriors Tale and Vintage Clouds. Incidentally, Vintage Clouds is the horse that was tipped for the race, in this space, back in October – and is still the most likely winner. Meanwhile, JP McManus (who owned 2010 winner Don’t Push It) is one of the World’s biggest gamblers and his horses Regal Encore and Anibale Fly are sure to be well supported on Saturday. Other racehorse owners try to buy the winner on the eve of the race. Stranger things have happened, so keep an eye on Don Poli and Outlander who were sold at a special auction on Thursday evening. Trainer Nigel Twiston-Davies’ has often done well with his runners over the big fences, winning the Grand National twice with Bindaree and Earth Summit. This year he runs Ballyoptic and Go Conquer. I’d love Cartmel trainer James Moffatt to win the race, and his entry (Just A Par) has just scraped in having been first reserve for the race after the declaration stage. Some Jockeys negotiate the course particularly well too – such as Ruby Walsh (twice a winner) who rides Rathvinden and Daryl Jacob who won the race on Neptune Collonges and this time gets the leg-up on Valtour. I have the worst of all records of picking the winner, so you can safely ignore everything on my shortlist above… Which leaves you with: Rock The Kasbah, Step Back, Singleframpayment and Walk In The Mill. Expect them to fill the first four places. Good luck! Previous PostRisk Reducing Technology	Next PostWhy the Long Face?